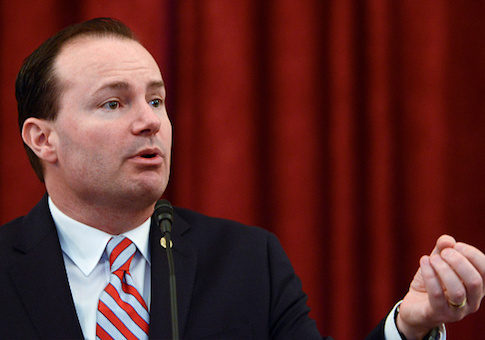 "What the hell is Mike Lee thinking?" asked one veteran congressional adviser apprised of the situation. "He's making common cause with a coalition of groups who make their money by calling Republicans warmongers and traitors. That's their job. That's how they get money from liberal donors." In addition to their anti-war stances, many of the groups included in the letter played a role in the so-called pro-Iran echo chamber established by the Obama administration to galvanize support for the landmark nuclear deal with Iran. This includes the liberal activist group CREDO, which helped organize and provide pro-Iran talking points to supporters. "These are the groups that made up the Iran echo chamber and that push for boycotts against our Israeli allies," the source said. "Some of them have personally targeted him with petitions and political attacks. He's obviously getting bad advice. These are not his friends." Lee's office declined to comment on the letter or the email promoting it. In addition to Code Pink, the letter publicized by Lee's office includes the support of Antiwar.com, MoveOn.org, U.S. Campaign For Palestinian Rights, and many other organizations known for their anti-American advocacy and ties to radical groups. Congressional officials opposed to Lee's effort, which would require the Trump administration to get war approval from Congress for any further operations in Yemen, told the Free Beacon that key U.S. national security operations hang in the balance. U.S. forces have not provided direct military aid to Yemen, only providing tactical support such as intelligence sharing and mid-air refueling capabilities. The issue has sparked fierce debate on the Hill, which is said to have come to a head during a recent lunch meeting with congressional officials. Sources with knowledge of the closed-door meeting told the Free Beacon that Lee-Sanders supporters had a heated exchange with opponents of the resolution who believe the United States should play a supportive role in thwarting Iranian militant groups in Yemen. Such action could also erode the U.S. alliance with Saudi Arabia during a critical juncture in U.S. diplomatic efforts to counter Iran's proliferation of ballistic missile technology and other arms. "One of the biggest objections is that all of this hinges on how you define hostilities," said one senior congressional aide involved in the debate. "What we're actually doing in Yemen is providing air-to-air refueling and intelligence sharing. We're not engaging with the Houthi [rebels] directly in exchanging fire." Invoking the War Powers Act with regards to Yemen could also jeopardize similar U.S. operations across the region, sources said. "This is an incoherent policy that would help surrender the coasts along one of the busiest shipping lanes in the world to Iran," noted another senior congressional official working on the matter. However, anti-war activists, including those noted by Lee's office, argue that U.S. military action in Yemen has not been formally authorized by Congress. "This important legislation invokes section 5(c) of the War Powers Resolution of 1973 to require a debate and vote on ending unauthorized U.S. military involvement in Yemen's civil war," the anti-war activists write in the letter highlighted by Lee's office. "U.S. participation in the Saudi and United Arab Emirates (UAE)-led coalition's military operations in Yemen has not been authorized by either a congressional declaration of war nor a specific statute." "The United States has facilitated numerous violations of international humanitarian law in Yemen and the creation of the largest humanitarian crisis in the world," they argue. This entry was posted in National Security and tagged Iran, Mike Lee, Saudi Arabia, Yemen. Bookmark the permalink.